Fan-out kits are used in field and factory applications to break out and provide protection for fibers when terminating cables. Although 250um connectors are available, directly terminating 250um fibers is not recommended due to the lack of protection to the fiber. Buffer Tube Fan-Out kits are designed to breakout the loose tube fibers from a buffer tube, and provide 900um protection to each fiber so it can be connectorized (terminated). Corning Cable Systems offers two versions of the Buffer Tube Fan-out Kit; Indoor Buffer Tube Fan-Out Kits (FAN-BTXX-YY) and Outdoor Buffer Tube Fan-Out Kits (FAN-ODXXYY). Indoor Buffer Tube Fan-Out kits are available in 6 and 12 fiber counts and in furcation tubing lengths of 25 and 47 inches. Indoor kits are recommended in environments within a temperature range of 0° to +70°C (32°F to 158°F). In situations where colder temperatures are possible, the outdoor kit should be used. Outdoor kits include additional elements that compensate for wider temperature fluctuations. Different materials and the use of epoxy in the assembly allow this kit to be used over a wider temperature range. The outdoor version is recommended for use in environments within a temperature range of -40°C to +70°C (-40°F to 158°F). Corning Cable Systems’ Standard Recommended Procedures should be followed when installing each kit. With proven field installable connector technology, fiber terminations using Corning Unicam Connectors are fast easy and reliable. In addition, with UniCam Pretium Performance connectors, a broad operating temperature range of -40° to 75°C is offered, exceeding EIA/TIA 568-B.3. Pretium performance can be achieved with the Unicam Pretium Tool kit or the standard UniCam Connector Tool kit. With all other UniCam connectors, the temperate range is from 0° to 60° C.
Environmental conditions play a critical role in the selection of system components. Variations in temperature can cause expansion and contraction of materials thus affecting system performance. 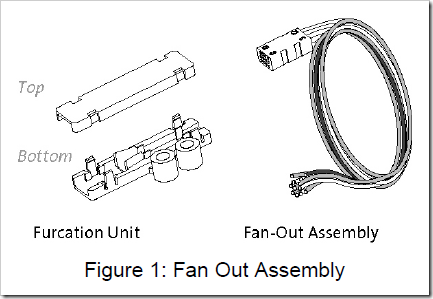 In order to prevent system degradation when using fan-out kits, each version has been designed for a specific environment, and it is important to know the operating range of your system when choosing your kit. The temperature ranges above should be used as a guideline when selecting the appropriate kit for each application.